This book is almost exactly what I thought it would be. Isaac Asimov was known for his wit, not to mention his substantial ego and and self-professed intelligence. He was the President of Mensa for some time, so I guess he was entitled to his self-regard, but he certainly wore it on his sleeve. As far as the book goes; as the forward explains the man was stuck in a couples-pair destination vacation where he was immensely bored and anxious about having to spend time with other people, so he borrowed a typewriter from the hotel and told his wife and friends he had to write a book. Putting aside for a moment the fact that the man wrote a 400 page book while he was bored on a vacation, the result is basically a compilation of his thoughts and theories on humor, paired with examples or anecdotes that illustrate his thoughts. The man’s jokes are clearly the type that are more amusing to the teller (and appeal to his or her cleverness) than to the audience, but they’re amusing in their own way. There’s also a pronounced yiddish streak to the jokes, both in language and in tone; these jokes actually make up the best parts of the book. Like I said, the jokes themselves are more groaners than anything else, but the book provides an interesting look into the man, who has always been one of my heroes, as well as a study in second generation Jewish immigrant humor. It also offers an amusing view into the changing mores and values of the late sixties as seen by someone who was well outside of the cultural forefront. Would I recommend it? Not really, unless those specific subjects interest you. But an interesting read for me. I should probably preface this by saying that I know diddly-squat about music, beyond the fact that I like it and I have terribly broad (or just terrible) tastes. This post, and the subsequent ones, will be devoid of proper terminology and explanations. Deal with it. Ok, so the band, Lucky Chops. I like jazz, but I don’t think I could say I love it. My tastes run towards more melodic pieces than improvisational ones, and I like a heavy, brassy sound. A perfect example would be this recording of the Toronto Jazz Orchestra doing a cover of Karma Police. I made this recording on my phone, so the picture/sound quality isn’t great, but the song had a clear rhythm, and the 18-odd pieces harmonized in their own way to create the deep, rich sound that I like from my jazz. So, I like this song. Fast forward to last fall, when a Saturday morning spent doing anything but something productive leads me to this Youtube video. 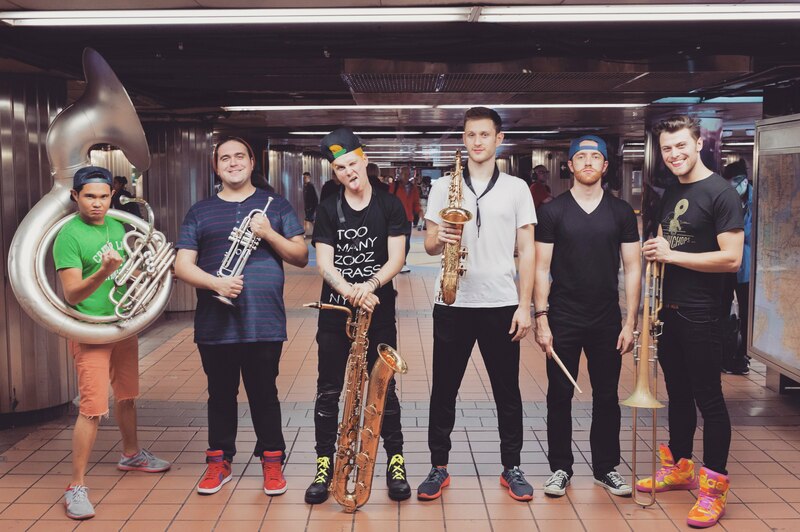 This is a recording of a band called Too Many Zooz. They’re a self-styled “Brass Hop” band, producing “house” rhythms using analog brass and percussion instruments only. It’s a neat sound and and very catchy. I was thinking about them the other day and in my googling I eventually found my way to a video from Lucky Hops, as they share some participants and approaches. Lucky Hops is a bit closer to a traditional style, playing jazzy covers of pop and funk songs. The pace is more relaxed, but they still (like Too Many Zooz) rely on percussion and primarily a baritone sax to provide a rhythm. The easier pacing and rhythm also makes it easier to pick up the emotional ‘weight’ of the performers. To me music is easier to enjoy when I can hear the individual threads of performance and the creative input of the musician. This, when compared to the more frenetic pacing of Too Many Zooz aligns a bit more closely to my own sensibilities. The tracks on this album include some original songs as well as covers, and the pace varies from one track to the next, which is why I purchased it over the Too Many Zooz album. I’ve already listened to it once as I was doing some work today and it made a great companion to my thoughts. It’s a neat sound, which I highly recommend checking out if the opportunity presents itself. Here’s a good sample of their stuff. I have the sneaking suspicion next month may feature some klezmer music.